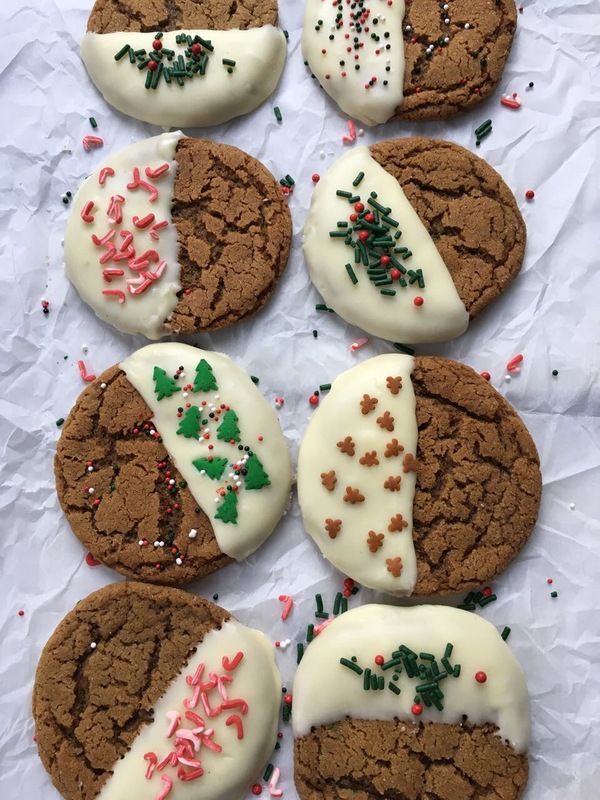 One of my favorite Christmas classic cookies are the Ginger Molasses Cookies. There’s just something about them that is so endearing and comforting. Maybe it’s the spices in it or the chewy texture when you bite into it. 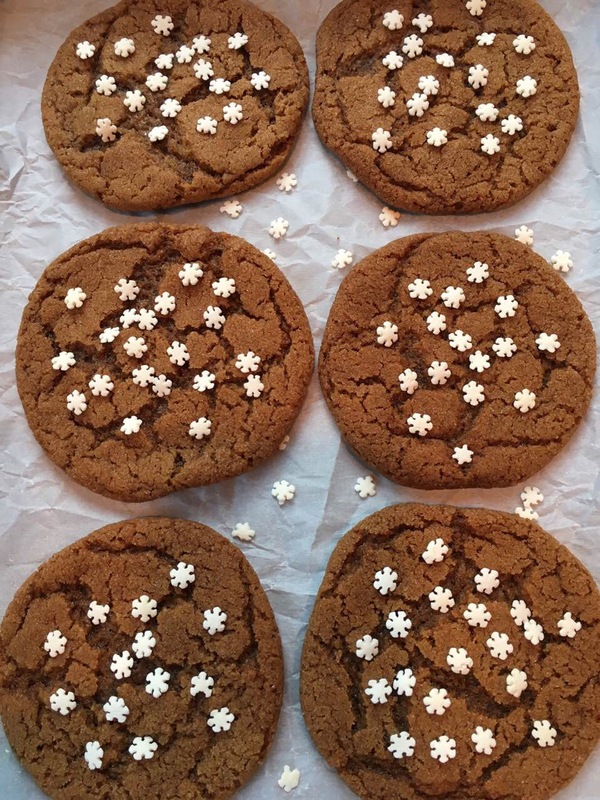 To me, Christmas won’t be complete without baking these delicious cookies. When I bake these cookies, I do it five different ways and I like all of them. I leave some of them plain. Some I dip in melted white and dark chocolate then dust them with sprinkles. I also mix in some chocolate chunks on a few of them. My family and friends love them and they disappear fast. The ingredients in this recipe are very simple. I have fun buying different Christmas sprinkles ahead of time and I enjoy using them. Let the butter soften on the counter the night before. Thirty minutes before baking take the egg out of the fridge and let it come to room temperature. Before shaping the cookie dough into balls, dust your hands with a little flour and shake off the excess. This will prevent the dough from sticking in your hands. Cream the softened butter using a stand mixer or hand mixer on medium speed. Add the sugar slowly, beating until light and fluffy. Scrape the sides with a rubber spatula. Now it’s time to add the egg and molasses. Beat until combined. In a medium bowl sift together the flour, baking soda and all the spices. Stir in the candied ginger. Add this mixture to the wet ingredients and beat together slowly until combined. Scrape the sides again and beat one last time. Chill the dough for 20 minutes in the fridge. While it’s chilling, preheat the oven to 350F degrees on the middle rack. Line three large cookie sheets with parchment paper. If you have only two, no worries. Just reuse the first sheet for the third batch. It will have slightly cooled by that time. Always use fresh parchment paper on all 3 batches. Take the dough out of the fridge. Place a cup of sugar in a small bowl. Dust your hands with a little flour and shake off the excess. Use a small cookie scoop and shape the dough into 1-inch balls with your floured hands. Place the balls on the parchment paper. I do eight balls first , then take each ball and dunk it into the sugar and coat the whole thing. Place each sugared ball back into the parchment lined baking sheet. Place eight balls in each sheet making sure they are two inches apart. The dough will spread. Bake this batch first in the preheated oven at 350F degrees for 11-12 minutes. My oven baked it for 11 minutes. The cookies will appear slightly soft but it will get harder as it cools. Bake the cookies in 3 batches. Do not overbake them! If you like to add 1/2 cup of chocolate chunks, mix it in with the last half of the dough before shaping it into balls. This way you have half plain and haIf with chocolate chunks. If you like to dip it in white or dark chocolate, melt the chocolate in a double boiler in simmering water. Stir the chocolate until smooth. Turn off the heat. Wait until the cookies are cooled completely and firm before dipping. Dust it with your desired sprinkles. Have fun with it! Cream the softened butter using a stand mixer or hand mixer on medium speed. Add 1 cup of sugar slowly and beat well until light. Scrape the sides with a rubber spatula. Add the egg and molasses and beat until combined. In another bowl, sift together the flour, baking soda and all the spices. Stir in the candied ginger. Add this mixture to the wet ingredients and beat slowly at low speed. Scrape the sides and beat one last time. Chill the dough in the fridge for 20 minutes. Meanwhile, preheat oven to 350F degrees. Line 3 large baking sheets with parchment paper. Take dough out of the fridge. Dust your hands with a little flour. Use a small cookie scoop and shape dough into 1-inch balls with your floured hands. Place each ball on the lined baking sheet. Fit only 8 balls on each cookie sheet making sure they are at least 2 inches apart. The cookies will spread. Take each ball and roll it in sugar, coating all sides. Bake each sheet in preheated oven at 350F degrees for 11-12 minutes in the middle rack. Cookies will appear a little soft in the middle but will harden as it cools. Do not overbake. Let cookies cool for 5 minutes on baking sheets, then transfer them to wire racks to cool completely. Optional: If dipping cookies in melted white or dark chocolate, use double boiler to melt chocolate in simmering water. Stir chocolate until smooth. Turn off heat. 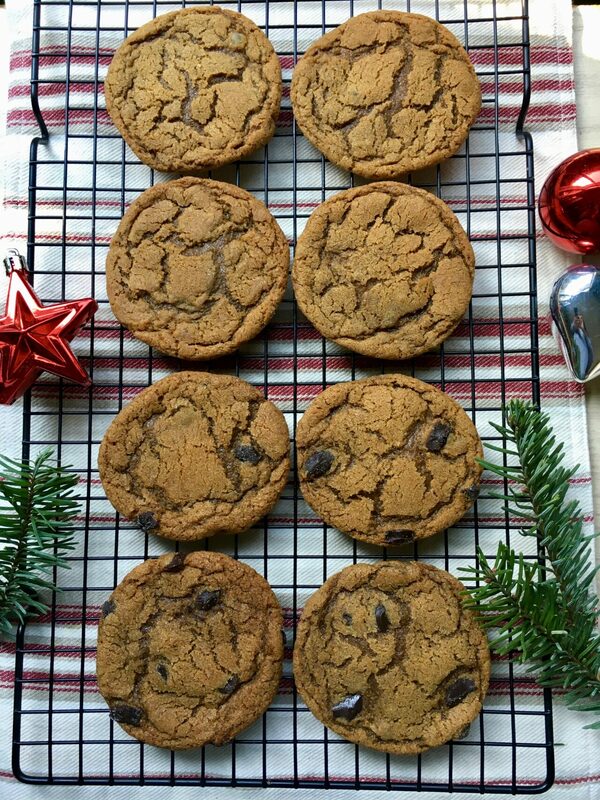 Let cookies cool completely before dipping in chocolate. After dipping, dust with desired sprinkles. If using chocolate chunks, add 1/2 cup of chocolate chunks into the last half of the dough before forming it into balls. This way, half of the cookies will be plain and the other half with chocolate chunks.